One of the harsh realities I learned about when I started working in the “big city” is homelessness. I wasn’t used to seeing so many people in need on corners, on the metro, in the park. Sure, we’ve heard that homelessness is an issue, but not everyone SEES homelessness as an issue. When I saw people literally pushing all of their possessions around in a broken grocery cart, I truly began to appreciate how fortunately I was to have a home and I realized how simple acts of kindness can help my community. Giving back to your community doesn’t have to be difficult or expensive. Sometimes the best thing that you can contribute is time. There is always a food bank or shelter that could use some extra man power. I spent some time working at a women’s shelter, where I helped to teach women how to type and use the internet. I can’t even begin to describe the triumphant look of a woman who had just conquered QWERTY. There are many organizations that help distribute food to those in need. You’ll find that a small donation of your time will help them provide needed food to local families in need. Take a quick look around your house. 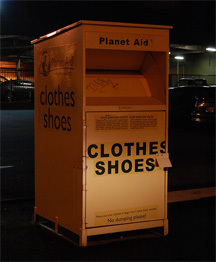 Do you have old clothes or old shoes that you don’t wear? Do you have a collection of make-up and perfume samples that you’ve gotten with those “free gift with purchase” items? (Come on, I know you do!) All of those can be donated to your local Goodwill to help clothe community families. Don’t forget that most in-need families have children, so toys and children’s clothing is always a plus as well. You can even get your kids involved by having them pick out one or two items that THEY want to give to help another little boy or girl. Finally, don’t underestimate the power of a kind word or a dollar. Sadly, many of those who need help are often shunned by others. There seems to be an unspoken assumption that people who ask for money will spend it on something they don’t need. What they do with the change is their choice, however you have the power to give that money with a prayer that it will bless them. That is your choice. With the holiday season, the season of giving, coming up, take a moment to look around your community to see how you can help give back. Disclaimer: This is a sponsored post consists of my opinions only. Your experiences may be different.